Just before my Mother passed away she gave me one of her cookbooks. It was actually one of those photo albums that held the photos with the stick pages. She put the recipes she loved dearly or the ones she wanted to try on each page. I actually thought about going through it and just getting out the recipes that I know that are good and ditching the book. I just can't make myself, it's a part of her you know. She went through the trouble of saving recipes that came from relatives, magazines, or even ones she made up herself so I'm going to treasure it always. 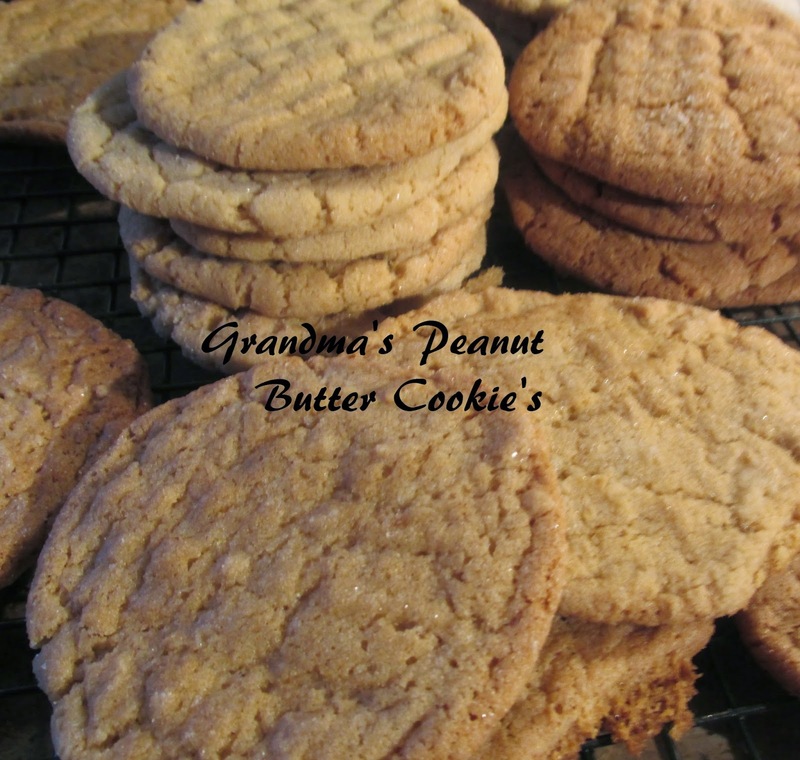 As I was turning the pages I found a faded letter from my Grandma to my mom that included her Peanut Butter Cookie Recipe and couldn't wait to try it. Written in my Grandmother's loving hands it's a tiny window in to my past. I was a young girl when she passed but I remember adoring my Grandma. She was such a kind sweet person and always had a hug to give. At Grandma's we ate cookies, took baths in the washtub in the hen house, and we thought it was great fun going to the outhouse. We were city kids clear through! Grandma's original recipe called for lard...something that's not in my pantry at the moment. So I used an equal portion of butter and added some vanilla. I noticed that the recipe didn't call for a lot of peanut butter but the taste was right on. My husband loved them last night. I made huge ones with a tablespoon of dough but you can try smaller ones with just a teaspoon. Combine sugars together in a large bowl. Then mix in lard or melted butter (cooled a little) and stir. Gradually add eggs, then peanut butter and vanilla. Stir to mix thoroughly. Sift together dry ingredients then stir in the peanut butter mixture. Take a tablespoon of the dough and roll into a ball. Roll the ball into the sugar in the bowl. Place the sugared ball onto a ungreased cookie sheet and press with a fork tine in a criss/cross pattern. Bake in a 350 degree oven for 8 to 10 minutes or until done. Adjusting the time for how big you make them. Tip: Watch carefully these wonderful cookies will brown up quick and they are better when they are lighter brown and soft. I was featured at Tuesday's Table at Love from the Kitchen!